Speculation over President U Htin Kyaw’s health is growing among politicians, army officers and diplomats. U Htin Kyaw has been receiving medical treatment in Bangkok since late last year, and plans to visit Singapore for further treatment soon. Top army officers and diplomats have noted U Htin Kyaw’s frail appearance, and the president has been advised not to attend state functions. The 71-year-old recently traveled to Japan at the invitation of Prime Minister Shinzo Abe to attend the Universal Health Coverage Forum in Tokyo. However, he also received treatment there, according to unconfirmed reports. The president was seen eating rice soup at a state dinner. Believing this to be inappropriate, and likely to fuel concern, senior NLD leaders advised U Htin Kyaw to avoid regular state functions. One of his most recent appearances came in the second week of this month when U Htin Kyaw, accompanied by First Lady Daw Su Su Lwin and high-ranking officials, flew to Putao, Kachin State, where he attended a bridge-opening ceremony. In December, State Counselor Daw Aung San Suu Kyi was forced to deny speculation that U Htin Kyaw’s health had deteriorated following an operation in September. Other NLD leaders said the president had undergone stomach surgery, but did not have cancer. “There is no need to worry. We have the first lady who will take care [of the president]. So why do we need to worry when there is someone to take care of him?” Daw Aung San Suu Kyi said. This has not stopped speculation over who would replace U Htin Kyaw should he step down, however. The son of a respected national poet, U Htin Kyaw is loyal to Daw Aung San Suu Kyi and previously served as an adviser to her and the party. The president, himself a respected writer, holds an economics degree and studied computer science at the University of London. He was a schoolmate of Daw Aung San Suu Kyi at Methodist English High School in Yangon. In the 1970s, he worked at the ministries of Industry and Foreign Affairs, and married Daw Su Su Lwin, a politician and NLD lawmaker since 2012. Ineligible to be president, Daw Aung San Suu Kyi nominated U Htin Kyaw to fill the position. According to the 2008 Constitution, the president has executive power but U Htin Kyaw’s role has been seen as ceremonial, with the State Counsellor wielding the real power. He is seen as a gentleman with a soft-spoken style and few enemies; the generals don’t have any issues with U Htin Kyaw and seem to respect him. A top general once said the military has no problems with the president, as he had never antagonized the Army. However, they are now closely watching what’s going on in the presidential palace and with U Htin Kyaw’s health. The president has made few public appearances since taking office early last year. 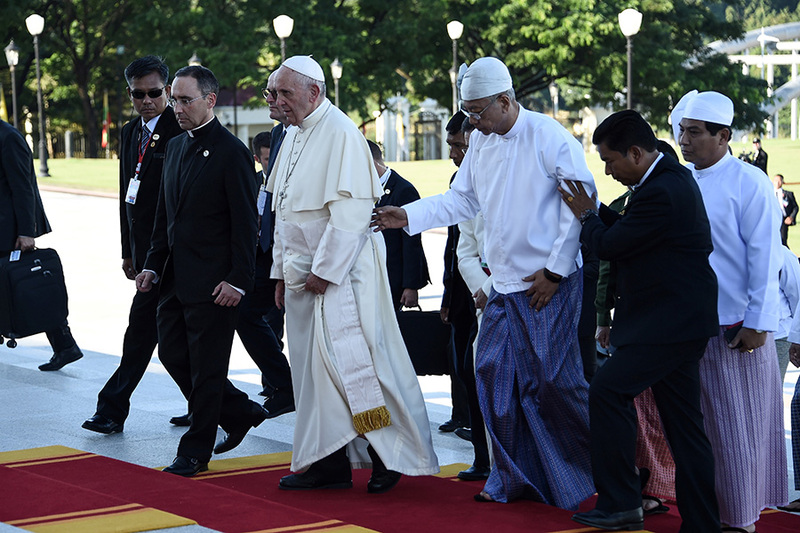 He appeared thin and pale when he received Pope Francis in Naypyitaw in December. According to the Constitution, if the president passes away while in office or retires, the first vice president becomes acting president and an election must be held to elect a new vice president. The president is then elected from among the three vice presidents. Former Army General Myint Swe is the current first vice president. It remains an open question whom Daw Aung San Suu Kyi would choose to replace U Htin Kyaw should he retire. One of the strongest candidates is Dr. Myo Aung, a member of the central executive committee of the ruling National League for Democracy. The former physician and political prisoner was tipped for a vice presidential role two years ago. He now holds the powerful position of chairman of the Naypyitaw Council. He is considered loyal to the State Counselor and is trusted by her. The second-most-likely candidate is Dr. Zaw Myint Maung, chief minister for Mandalay Region. His status as a potential president was the topic of speculation when he accompanied Daw Aung San Suu Kyi on a trip to China recently, but he now seems to be very much a second-choice candidate, well-informed sources said. A more controversial candidate is Thura Shwe Mann, a former general and House speaker who was the third-most-powerful man in the former ruling State Peace and Development Council. A one-time senior figure in the formerly ruling Union Solidarity Development Party, Shwe Mann has expressed presidential ambitions in the past. He was kicked out of the party after a long-running dispute with former President Thein Sein that began in 2012. He was appointed in February 2015 as head of the Commission for the Assessment of Legal Affairs and Special Issues. He is seen as close to Daw Aung San Suu Kyi and is in weekly contact with her in Naypyitaw. However, Thura Shwe Mann’s relationship with top army leaders is in a tailspin. To improve relations with the armed forces the State Counselor will likely choose someone who can maintain cordial relations with top brass. More importantly, she will need someone she can trust and from whom she can expect absolute loyalty. U Htin Kyaw was a safe choice. But with his health now an issue she is no doubt developing contingency plans. Should the president retire, whoever takes the keys to the castle from U Htin Kyaw will need to have Daw Aung San Suu Kyi’s full confidence.